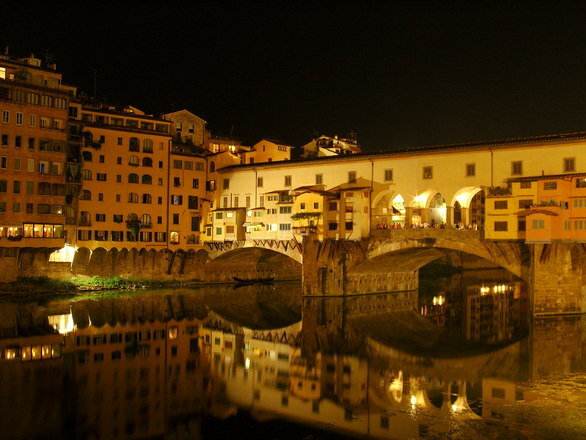 Since nearly everything you see in Florence is graced with a sense of artistic flair, you’re best off undertaking this city with a licensed tour guide in Florence to get a good eye-full of all that you encounter. However, during the summer the rather small, sometimes non-existent, sidewalks can get quite crowded. So if you’re looking to speed up your transportation the alternatives are city buses, taxis or, if you’re adventurous, motor scooter and bike rentals are available as well. If you’ve ever seen a panoramic photo of Florence, then you’ve seen the Basilica di Santa Maria del Fiore (or Duomo) and its red-tiled dome that rises above the cityscape. Located in the center of Florence, the church itself was started hundreds of years before Filippo Brunelleshi (who’s tomb is on display inside) adorned it with its famous dome in 1436 and is one of the largest churches in the world. The gothic interior is laid out in the form of a Roman cross and is adorned with important works of art and one of the most magnificent stained glass works in all of Italy. Just down the street is the Accademia Gallery where you’ll find Michelangelo’s David. Many visitors wait in long lines to pay admission to view this magnificent piece of work only to immediately leave without noticing that the pieces which adorn the hallway leading to David are Michelangelo’s as well. For a more enriching experience, slowly make your way to David and inspect these half-completed works. By doing so, you’ll have a greater appreciation of the craftsmanship and patience that it took Michelangelo to carefully carve such life-like sculptures out of solid blocks of stone. Crossing the Arno River via the Pont Vecchio (Old Bridge) you’ll come upon the Palazzo Pitti, the grand palace which houses numerous museums and some of Italy’s best paintings. Or if you’re in a mood to just relax, right behind the palace you can take a break in the Boboli Gardens, Florence’s largest park and one of Italy’s best gardens. Within the 16th century designed park, beautifully maintained walkways weave through exquisite garden displays, statues, carvings and fountains. During the summer, the park is a picturesque and ideal respite from the summer heat.